More than 52 minutes of classic AOR Rock! The origins of the SUNSTORM project lie in tape trading! A few years ago, when they were just friends and fans, Serafino Perugino (Frontiers Records President) and Mario de Riso (Frontiers Label Manager) used to exchange stuff and music to listen. One day, Mario gave Serafino a cassette he had from a journalist, with the “unreleased Joe Lynn Turner” second album demos. This tape featured some glorious songs, that followed very well the musical path established by the former RAINBOW singer on his debut solo album “Rescue You”. Many years passed after that day, but when Frontiers finally signed Joe Lynn Turner to the label, Serafino took the chance to ask Joe about those songs. Turner thought that it was time to take off the dust to that material. According to the singer: “I was writing at the time for a more commercial market and was concentrating my abilities on songwriting especially. I think the songs I wrote at the time, can stand the test of time because they are classics. A great song is a great song, no matter when it’s released. Those songs should have made it to my second album for Elektra, but then I fired the producer and then the mess started and we decided to part ways with the label and nothing happen for no reason”. Taking inspiration from the material available, Perugino reconnected Joe Lynn Turner with Jim Peterik, the glorious AOR songwriter (ex SURVIVOR and now mastermind of PRIDE OF LIONS) with whom he collaborated a few years ago. “Jim and I are great friends and I admire him a lot”, says Joe, adding “it is a little known fact that Jim was called in to help the songwriting for Deep Purple’s follow up to the “Slaves and Masters” album. Together with me and Ritchie, we wrote some killer stuff which was later rejected by the other guys, since they thought it changed the direction of the band too much”. Turner, therefore selected some of the material sent by Peterik, along with a few other tracks submitted by Perugino and agreed to give birth to a project that could rediscover and highlight the AOR roots of his voice and sound. Frontiers hired once again the amazing Dennis Ward (PINK CREAM 69) for the job of creating the perfect production and background performances behind his voice, similarly to what happened to the critically acclaimed PLACE VENDOME album. Also featured are Uwe Reitenauer on lead guitars, Chris Schmidt on drums and Jochen Weyer on keyboards. The resulting album is a monster piece of classic AOR the way it should be and sound in 2006, but with the class and the fascination of the 80’s! 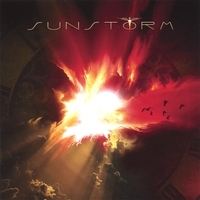 Turner says: “There is plenty of other songs from that era that I believe should be heard… maybe someday” …the doors to the SUNSTORM chapter II are opened from now, it will be up to the fans to decide whether they will want it to happen!